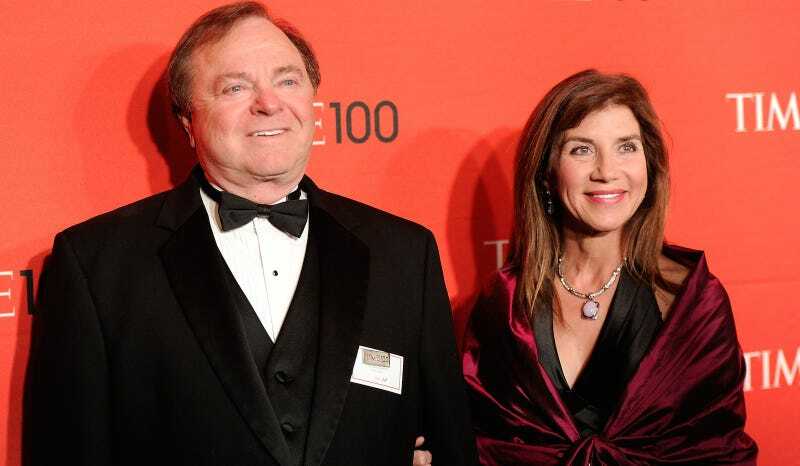 Continental Resources CEO Harold Hamm and his ex-wife Sue Ann Arnoll in happier times. Image via AP. Sue Ann Arnall, the ex-wife of billionaire oil tycoon Harold Hamm best known for rejecting—and then depositing—a nearly $1 billion divorce check, is evidently not done sticking it to Harold: the Associated Press reports that Arnall is hosting a fundraiser for Hillary Clinton less than a week after Hamm hosted one for Trump. Damn, I love this. Our very relatable friends Sue Ann and Harold, who were married for 26 years, recently wrapped up what has been referred to as one of the largest divorce cases in U.S. history. Both appealed a ruling that awarded Arnall (a lawyer and economist who worked as an executive at oil driller Continental Resources, where Hamm is CEO) nearly $1 billion—Arnall contended it was too small, just a small fraction of what was (prior to falling oil prices) an $18 billion marital estate, while Hamm argued the amount was too high. After depositing the check, Arnall lost her appeal. In 2012, the couple hosted a fundraiser for then-GOP presidential candidate Mitt Romney, who also courted Hamm as a possible energy secretary. How times have changed. This past weekend, Hamm co-chaired a private fundraiser for Trump; on Friday, Arnall will host a reception at her Oklahoma home with Democratic vice presidential nominee Tim Kaine. I will absolutely be there in spirit.